Hello from London! I’m currently in the midst of finals period, studying for my political economy exam on Tuesday. This month I’ve enjoyed exploring Central Europe and rediscovering my love for London during my final few weeks. With the sun shining in London, it’s easy to spend the whole day outside walking around the parks and exploring new neighborhoods. In this blog, I’ll discuss trends and implications of global inequality and end with highlights from my trip to Egypt and Israel. Both vertical (within country) and horizontal (between countries) inequality have risen since the Energy Revolution in the mid-1700s. Though economists disregard its significance, heightened inequality has implications for power relations, economic growth and social cohesion. Up until the energy revolution, much of inequality was vertical (within country). 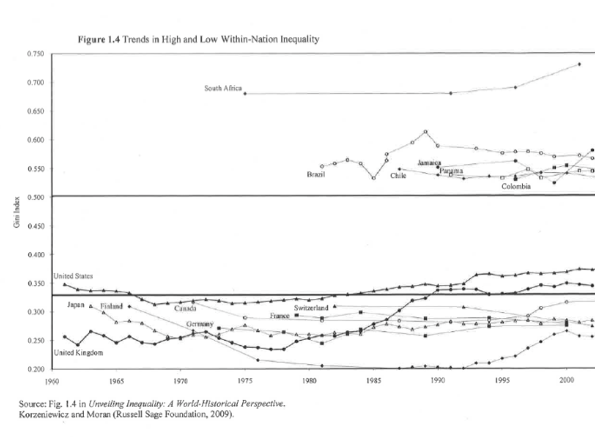 However, since the 20th century most of inequality has been horizontal (between countries). 70% of global-interpersonal inequality is due to inequality between countries, and 30% to within countries. From 1960-2000, the ratio of average income of the 10 richest countries relative to the 10 poorest increased by 4x. Over the 2000s, the ratio fell for the first time since the Industrial Revolution. Though the relative inequality gap between countries has recently declined, the absolute gap is still large and growing. Economics predicts income convergence, however nobody knows how long it will take for shares of population to become roughly equal to shares of world output (income). Since the rise of neoliberalism in 1980, inequality in both developed and developing countries has increased. Between 1980 and today, inequality has increased in more than ¾ of advanced countries and in most developing countries. Developed: Seven major developed countries all show closely correlated trends: a fall in income concentration between 1930-1980, and an increase starting in 1980. As further evidence of recent income concentration, in the US, from 2009-2013 the richest 1% received 95+% of total income growth (excluding capital gains, taxes and transfers). ​Developing: Inequality within developing countries has remained high and is much greater than that in developed countries – as indicated by GINI measures. 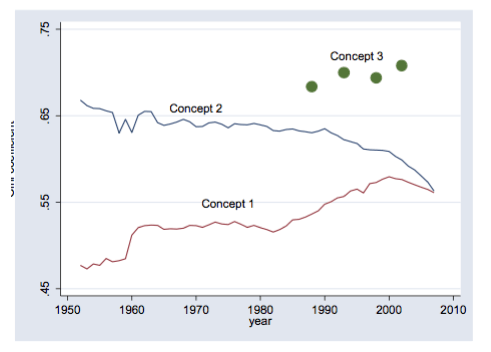 Inequality between individuals has probably fallen very little between 1988 and 2008 (concept 3). 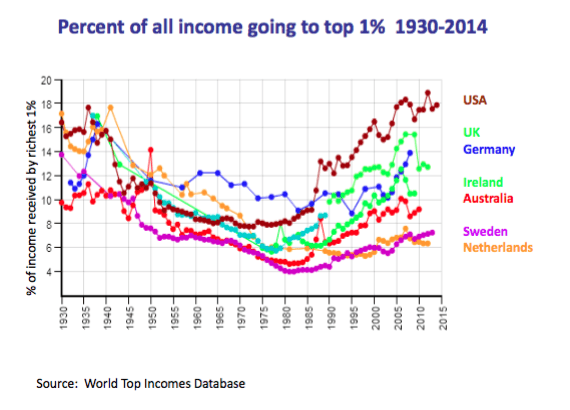 This is contrary to expectations of income convergence in the globalization argument. 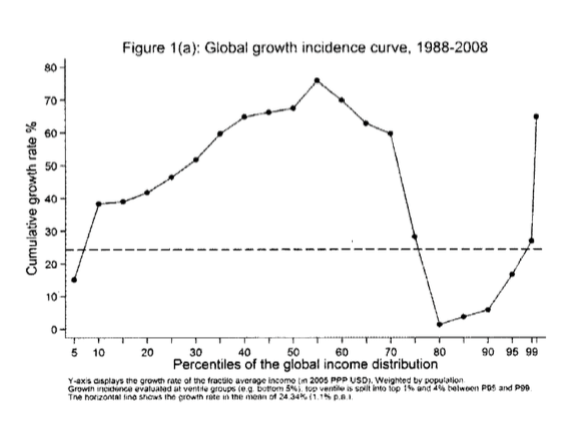 Branko Milanovic’s “elephant curve” (global growth incidence curve) depicts how global growth from 1988 to 2008 differentially affected discrete income percentiles. The chart indicates that income growth in the 40th-60th percentiles (mainly gains in China) and the top 1% was the highest. Income growth in the 70th-90th percentile was negative – these people mainly lived in the West, and likely feel they have not reaped the benefits of globalization. From the 1950s to the late 2000s, inequality largely disappeared as a political issue. Economists ignored the trend of rising inequality because they believed it was a reflection of marginal productivities and that inequality creates incentives for effort and creativity. Additionally, the Kuznets inverted U curve of within-country inequality posits that inequality will fall automatically as countries grow richer. Despite economists’ predictions, income convergence has not occurred. Rising income inequality further entrenches core-periphery power relationships, affects global growth, and has negative social implications. 2 – The world is experiencing lower and more volatile growth. Income concentration induces a savings glut at the top and underconsumption below. Concentrated wealth seeks higher returns through finance, which distorts business incentives and channels investment away from materially-productive industry. There is a strong link between income inequality and financial fragility. Recent academic debate and rising populist movements indicate a rekindled interest in the implications of inequality. The lack of income convergence serves as evidence that the inequality problem might not be able to resolve itself. I took advantage of the 1.5-month revision period at LSE to visit my friend Emma in Egypt and learn about the country’s history and politics. We spent the first three days walking the streets of Cairo, visiting the Egyptian museum, and riding horses by the pyramids. The nights we had in Cairo were unforgettable – sitting outside on Emma’s porch listening to Egyptian friends’ discussion about history and politics in the Middle East. Emma and I then took a bus to Alexandria and visited the old library and the site of the lighthouse. After spending the next day in Marsa Matruh, we headed into the Siwa desert. Our Bedouin guide took us to different oases and through the sand dunes. The photo below shows us in a salty lake, floating without any difficulty! ​After 10 days in Egypt, I headed east to Israel. My friend Catherine and I rented a car to better explore the country. After spending a day in Old Jaffa, we drove north to Haifa to see the Bahai Gardens and to Acre to see the old Crusader capital. We then drove to Galilee and walked in Jesus’s footsteps, visiting sites of his miracles and places of his preachings – Kafr Kana, Capernaum, etc. In Magdala, a priest took us on a tour of the excavated site and described the scene of Mary Magdalene running into her church, proclaiming that Jesus Christ had risen. After Galilee, we drove to the Dead Sea to see the sunrise from Masada Fortress. We then visited old Roman and Crusader ruins before heading to Jerusalem. In Jerusalem we walked along the Via Dolorosa where Jesus carried the cross to his death, visited the Church of the Holy Sepulchre where Jesus was crucified and other holy sites such as the Western Wall. Catherine and I took a Palestinian-led tour into the West Bank to visit Bethlehem and Hebron and to learn about the Palestinian perspective. We ended our trip on the beaches of Tel Aviv, eating mass amounts of hummus and soaking up the sun. Three weeks left in London until I leave and head to China for the summer! 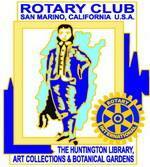 Excited for the learning experiences to come.